Last winter, I thought that catcher might be the most dominant position that the Cubs had in their minor league system. When it comes time to reassess the system this fall, I might be persuaded to change my mind based on the work of this year’s relief corps; 3 of whom could find their way to Chicago this year, if needed. 1. Dillon Maples might be the reliever that most Cub fans know about in the minor-league system. He got off to a bit of a rough start this year at AAA Iowa but has been pitching well since the second week of the season. His K rate is astronomical at over 20 per nine innings. Still, when the time has came to bring up a pitcher to Chicago, Maples has been bypassed five times already as he continues to try to cut down on his walks. He’s walked 6 in 10 appearances. At some point this year, he’s going to get another crack at the majors. 2. Randy Rosario – What I liked about the Rosario signing this winter was that he was young, 23, had some MLB experience, and was a left-hander. The Cubs have kept him down at AAA Iowa, and, over the past six weeks, he has yet to allow run. He is also missing some bats as he’s struck out 10 in 15 innings and his batting average against is a minuscule .173. 3. Dakota Mekkes – If there was any prospect that could skip AAA and go to the majors from AA, it would be Mekkes – although I doubt that happens. However, Dakota has just been dominating AA. And like Myrtle Beach last year, Mekkes has not allowed a run in his 13.1 innings in 10 games. That include Includes Tuesday night’s extra innings save where he began the inning with a man on second base. His walk rate is a little better this year, but, like Maples, Mekkes still has room to improve. But to be frank, I don’t think there’s much left for him to do at AA. He should be in Des Moines and soon. 4. Jhon Romero – As the season goes on, Romero’s two pitch mix, a 93 to 95 mile an hour fastball and a sharp breaking curve, seem to be improving in Myrtle Beach. When I first saw him at South Bend last year, I wondered what he was doing there as he baffled Midwest League hitters. What I like about Romero is that he gets some ugly swings as batters just can’t time him up, especially on the curve ball. I don’t think he’s long for Myrtle Beach either. 5. 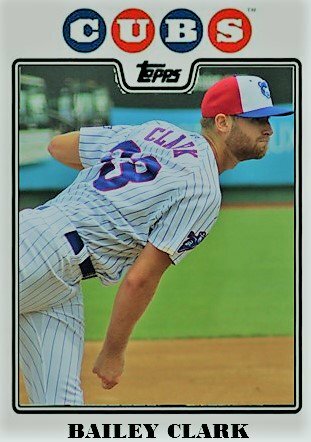 Bailey Clark has already been promoted once, and at the rate he’s going in Myrtle Beach, he’s not gonna be there long either. Last year, Maples went from Myrtle Beach to the majors. I think Clark could come close to moving three levels this year. But first, he’s got to continue what he’s doing well. He’s using a mid 90s to upper 90s fastball in combination with a hard biting slider that he’s able to command. Right now, between the two levels this year, he has a 1.17 ERA with 28 Ks in 23 IP. The big stat no one is talking about is he is averaging almost 5 ground outs for every fly ball/pop up – an astonishing rate. If he can continue to do that, he should be in Tennessee by mid June. However, the key will be to take it one level at a time. 6. Tyler Peyton – I really liked and enjoyed the progress I saw in him last summer in a relief role in South Bend as he was one of the best relievers in the system in August with a 1.29 ERA. He’s doing pretty much the same thing this year at Myrtle Beach and he’s even moved into the closer role a few times. I don’t know if he’s going to move up this year, but I like what I’m seeing as he continues to flash a 93 to 95 mile an hour fastball with a nice curve and change. I’m not really surprised these guys above are doing well. I am surprised that they are so dominant to begin the season. As it warms up, things could change a little bit over the next 4 to 6 weeks, but I think their ability to throw strikes is paramount to their success. I would also have included Rollie Lacy of South Bend on this list. However, he now has a rotation spot in South Bend replacing Jose Albertos. Still, I don’t know if Lacy will do that permanently or for the time being. Brendan King has only just begun to pitch at South Bend. King pitched well as a starter last year for Mesa. The 2017 draft pick out of Holy Cross has done very well in relief at South Bend. I don’t know if he’s going to get a chance to start, but I would be interested to see how he would do in that role, too. He usually is the upper 80s with his fastball to go along with a curve that he control and throw at will. With his command and a plus curve, he should do well at this level and high A. There could be other relievers who will pop in the next month from the bullpen. One never knows who is coming and when.